I’m very stingy when it comes to spending my money on books, but if there’s one author I don’t hesitate to buy a book from it’s Kasie West. I know her books will always be super cute and make me happy and Love, Life, and the List did not let me down. I loved how sarcastic Abby was. I loved the banter she had with pretty much every character in the book, but especially her equally sarcastic grandfather. I also found her mother to be a pretty empathetic character. She’s overly anxious and has some agoraphobic tendencies that I relate to all too well. I liked that the book didn’t just include Abby’s growth, but her family’s as well. I loved the friendship between Abby and Cooper. There was a little while there when I was actually rooting for them to just stay friends and for no romance to really be involved. But, I don’t feel like it’s a spoiler to say there is a romantic Happily Ever After involved and that it was cute and a little bit cheesy and I loved it. I also liked how Abby made a few more friends in the book with Elliot and Lacey. I wasn’t really sure what I would think of the list plotline. To be honest, it didn’t seem real interesting to me when I read the synopsis, but I ended up liking it. When she gets turned down for an art show because her paintings lack heart, her boss tells her that some more life experience will get her there eventually. She decides to try and speed up the life experience process by making the list. She also includes tasks inspired by people who have qualities she admires. I actually thought this was a really productive way to try and enrich one’s life. I think a lot of us say we want to try to be a better person, but don’t actually come up with ways to do that. I felt like this was a perfect book to read at the end of the year when we all try to come up with resolutions to do better in the future. 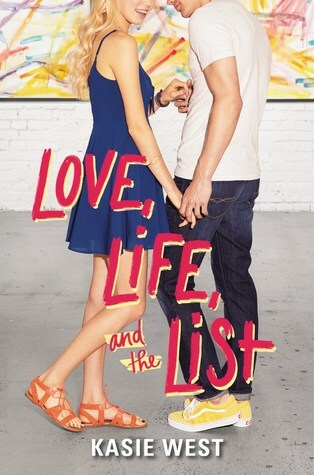 Overall, I really enjoyed Love, Life, and the List. It was so cute and I loved the friendship and the banter. It was everything I expect out of a Kasie West book and I definitely recommend it to fans of hers and Contemporary YA. Yay!!! I loved it too!! Thank you! I love her books too. I hope you enjoy it as much as I did! I need to put this on my list! Yes, you do! I think you will enjoy it! It’s so fun. I can’t wait to hear what you think of it! It’s a good one! I hope that you enjoy it when you get to read it! I knew I wanted to read this book, but you’ve got me even more excited for it. I love a sarcastic character! That is always the best news to get! I can’t wait to hear what you think of it! Definitely looking forward to another Kasie West book. I’m always a fan of seeing the importance of family especially in contemporary books. Great review. Can’t wait to find time for this one.